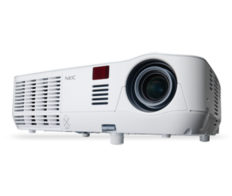 The V300X is a compact, lightweight projector that displays bright, realistic images even in less than ideal conditions, yet it and sets up quickly and saves energy, too. Versatility and brightness are the strengths of this projector. It can be used at desktop or ceiling level, and from front or rear of the projection screen. A nice variety of inputs is readily accessible, too, including audio inputs (two stereo mini jacks) as well as composite and S-video inputs with audio inputs (pair of L/R RCS jacks). Dual computer inputs make it a snap to switch between presentations, and an HDMI input port connects to high definition sources. With a maximum brightness of 3000 lumens, the V330X can clearly display images up to 300 inches (measured diagonally) from a PC or Macintosh computer, VCR, DVD player or document camera. With XGA native resolution, it is compatible up to UXGA. Although still portable, it is not exactly petite; the unit measures 12.2 by 9.7 inches, and is almost 4 inches high, yet it weighs only 5.5 pounds. No carrying case is included, although it is available as an accessory. Start up is quick and easy; the projector is ready seven seconds after the power is turned on. No cool down period is required, either; in fact, the projector can be shut down from the power strip even when it is projecting an image, and it can be put away immediately after powering down. With AutoSense, the projector syncs with most computer signals, and was ready to use whether the computer or the projector was powered up first. It is easy to correct color, keystone, zoom and focus from both the remote and the unit; there are even settings to adjust the color to compensate for a non-white screen, allowing the user to project onto a colored wall or even a blackboard, with satisfactory color reproduction. The brightness and color projected are impressive. Using a single chip projection system called BrilliantColor from Texas Instruments, the V300X projects true colors with its six-segment color wheel, even in a brightly lit room. In fact, the blues and purples were truer than those projected by a comparable LED projector. For theater-style viewing, NVIDIA 3D Vision is supported, allowing users wearing commercially-available NVIDIA or DLP Link Compatible LCD shutter eyeglasses to view 3D images with a supported graphics board of software. The V300X is also an energy-miser, with an ECO mode -- accessible from the remote control -- which reduces the brightness to 75%, extends the lamp life, decreases energy usage by 50W, and slows the fan speed. The image brightness is hardly noticeable, but the lower fan is impressively quiet. The Carbon Meter displays energy savings for the particular session or life of the projector in terms of CO2 emission reduction in ECO mode. The percentage of the lamp's remaining life can also be projected, as a percentage of the estimated 3000 hours. Brightness and energy savings are two attractive features for the classroom environment. Internal settings automatically optimize the image for Power Point presentations, TV viewing, movies, graphics or standard color value. Not only does the ECO Mode save energy, but it also reduces the fan's distracting noise. To further save energy, a timer can be set to automatically turn the projector off after any duration from 30 minutes to 16 hours. Built-in closed captioning enables decoding and display of text information from a video, and a 7W speaker provides the volume needed in large rooms. Administrators may also be interested in the projector's security settings, which prevent unauthorized use, and theft deterrence features. The V300X has an impressive assortment of features, yet it is easy to use, and it saves energy without sacrificing image quality. It will continue to be a useful classroom tool with its variety of connection options, including the ability to monitor it through a network, and with the optional ability to view 3D images. With the latest DLP engine and maximum 3000 lumens, this projector can display clear and bright images, with true colors, even in bright rooms and without a white screen. The V300X is an energy miser in ECO Mode, yet the image is not visibly dimmer, and the fan is noticeably quieter; timer ensures that the projector is not left on for long periods while not in use. Built-in security features help prevent theft and unauthorized use of or tampering with the projector.